I have to admit, my favourite part of any birthday is the cake! So when I woke up on the morning of my birthday this week and my boyfriend told me I had to stay out of the kitchen because he was baking me something, I was very excited! 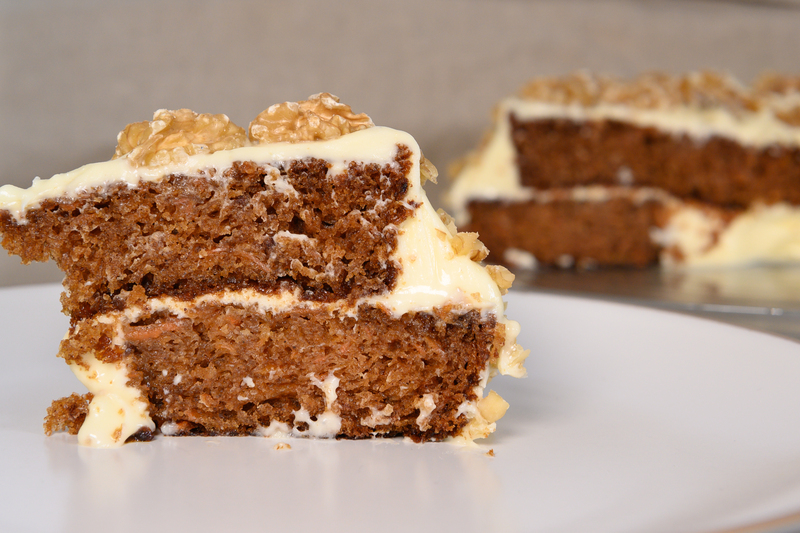 A while later I was no longer banished from the kitchen and he presents to me an incredible carrot cake, covered in cream cheese frosting and mountains of chopped walnuts! I didn't notice until we cut into it that the middle had been raw (dangers of cooking in an Aga! ), so instead Bart had cut it out and filled it with a sea of the cream cheese frosting! Not that I minded, it was delicious! We thought you would like to have the recipe to try for yourself! 1. Pre heat your oven to 180c while you grease and line two 9 inch cake tins. 2. In a mixing bowl add together the flour, baking powder, baking soda, cinnamon, ginger, nutmeg and salt and mix until combined. 3. In another mixing bowl add your oil, eggs, sugars, apple sauce, and vanilla extract and whisk until combined then add the grated carrots. 4. Mix the wet and dry ingredients together and stir until the mix comes together and all ingredients are well distributed. 5. Share the cake batter between the two cake tins and bake on 180c for 30 to 35 minutes or until the tops of the cakes look cooked and a skewer in the centre comes out clean (don't have a half raw cake like we did!). Remove from the oven and leave in the tins to cool for 20 to 30 minutes. Once the cakes have cooled remove the cakes from their tins and allow to cool fully on a cooling rack. 1. In a standing mixer or large mixing bowl add your cream cheese and mix with a paddle or a whisk until smooth for around a minute then add the icing sugar and vanilla extracting mix again until combined and you are left with a smooth, creamy frosting. 1. Place one layer of the cake stand upside down on a flat surface and spread around 150g of the topping evenly on top of this layer. Then place the other cake on top (again upside down) and cover the top and sides with the remaining topping. 2. Top with walnuts or a topping of your choice, personally I love to top with walnut halves and spread chopped walnuts on the sides! 3. Enjoy your delicious creation with a lovely cup of tea! 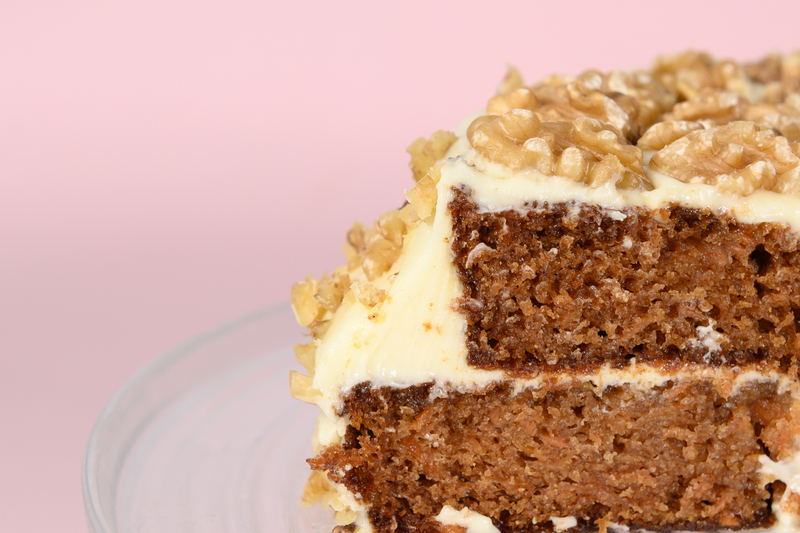 We had my whole family round for a big slice of carrot cake and everyone loved it, I am sure you will too! If any of you make this recipe please don't forget to share with #bakingwithalana, I love seeing your pictures!